Believe it or not, house painting in Boston isn't the same can of worms as slapping on a new coat in, say, Denver, Colorado. Climate plays a huge role in determining when to paint, how to paint, and what to paint with, especially with exterior paint jobs. In fact, that's exactly why choosing a painter who knows Boston is so important. If you're shelling out for a new paint job for your home, then it's safe to assume that you expect it to look good and last for a long time. The only way to guarantee that is to choose a Boston home painter, one familiar with the local tricks of the trade, and one who is dedicated to getting your job done right. What makes Boston so distinct from other areas when it comes to exterior painting? In a nutshell: the weather. Not only does Boston get weather coming from the inland, it gets the full brunt of being a coastal city, as well. It's also just far enough North to make Boston's winters famous, and the fact that Boston, along with most of the rest of Massachusetts, projects out into the Atlantic also makes it susceptible to Nor'easters and even to tropical storms and hurricanes coming up from the South. In short, Boston's climate is a unique one. Boston gets lots of rain, wind, snow, and fog, and has notoriously hot and humid summers. And while that combination of weather events can be rough on anybody, if you're a coat of exterior paint, that kind of climate is downright nasty. Boston's unique weather presents Boston house painters with an equally unique set of challenges. Poor adhesion, mildew, short painting seasons, and a climate that is generally tough on exterior paint, all come into play. That being the case, a home painter in Boston should know that using darker colors helps prevent mildew by creating warmer surfaces and thus less moisture build-up where mildew can take hold. They need to know that the long, wet winters soak into wood surfaces and make it tough for paint to adhere properly, and that as a result exterior painting projects really shouldn't be started until May or June at the earliest. And, a painter in Boston ought to know that applying a water sealer to a wood surface prior to the primer and finishing coats can work wonders when it comes to extending the life of a Boston paint job, even it does cost a little more up front. 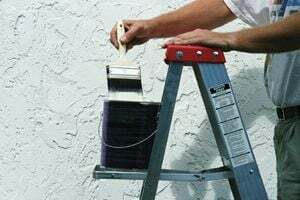 Knowing these tricks of the trade, and others, is exactly why finding a Boston home painter who knows what they're doing is such an important first step. While all that information is good to know, the big question for the average Boston homeowner is how they'll know whether they are getting the real deal with a Boston house painter or not? It's an excellent question, especially in a place like Greater Boston where the one hundred or so colleges or universities saturate the market with more inexperienced weekend college painters than you can shake a paintbrush at. Take the advice of fellow Bostonians on this one. HomeAdvisor asks each homeowner that uses our services what recommendations they'd give other homeowners about hiring contractors for specific projects. When it comes to painting, Boston homeowners are clear: get bids from several different contractors, and do a little research to confirm each one knows what they're doing. "Get several quotes, and read the reviews and/or contact references," said one homeowner. In fact, it's a strategy that pays off. The same homeowner concluded by summarizing their experience: "$1,600 for two days work for two guys, we supplied the paint, sounds like a total rip-off, but it was the lowest quote we got, and the quality was top notch." Trusting a referral service like HomeAdvisor is always a good way to go, but follow up on the contacts you get from us with your own research. Smart homeowners collect bids from at least 3 different contractors, and always ask for, and contact, references before hiring someone to do a job. In a climate like Boston's you want your painter to have a track record like the Celtics did back in the sixties (11 NBA Championships in 12 years). In other words, you want to hire a proven winner. Using a referral service like HomeAdvisor in combination with a little of your own digging around is the best way to ensure you'll get a home paint job that's going to stand up to Bean Town's weather, and that will last you for years to come. Comment: Hi I have a bedroom I'm looking to paint - it's got 9.5ft tall ceilings (more like 9 because i have moulding). and the room itself is 10 x 10 PLUS a 2.2 x 5.2 nook. I don't need the ceiling or moulding painted, just the walls and the nook. Please let me know and your estimate. Thanks! Comment: Fiberglass preying door is being installed and needs paint. Boston Painting Contractors are rated 4.79 out of 5 based on 3,318 reviews of 211 pros. Not Looking for Painting Contractors in Boston, MA?